The name "Rrose Sélavy," interpreted/translated in at least two ways: "Eros, c'est la vie" (eros, that's life) and "Arroser la vie" (to drink to life or, more sensually, to moisten life, as in arousal), is niche perfumer Maria Candida Gentile's toast to Marcel Duchamp and his female (drag) creation, Rrose Sélavy. As perfume inspirations go, it's intriguing and FUN — just like Gentile's Elephant & Roses idea. 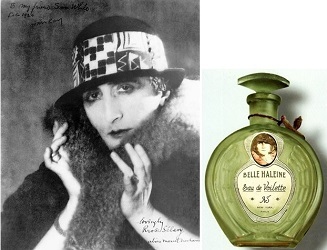 One of my favorite Duchamp/Rrose Sélavy projects was the 1921 readymade "perfume" Belle Haleine Eau de Voilette (translation: Beautiful Breath, Veil Water, see image above); using a found object (a Rigaud perfume bottle that had once held the popular perfume Un Air Embaumé), Duchamp, with the assistance of Man Ray, added a new label showing himself as Rrose and voilà — a new "fragrance" was born. Not that long ago — 2009? — the Duchamp/Ray Belle Haleine bottle was sold at auction by Christie's for, sit down, $11,489,968! 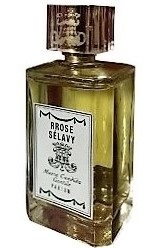 Rrose Sélavy goes on smelling sweet, like rose liqueur, with a BIG-rose aroma (I'm imaging deep-red, thick velvety petals on blossoms the size of softballs). I'm a rose lover: I grow many roses, make rose preserves in summer and also use faded rose blossoms in potpourri. The roses I tend, enjoy and use must possess one thing to justify the time and water they require: SCENT, and plenty of it. Rrose Sélavy delivers my kind of roses...roses in a variety "moods," from jammy to rose water "pink" to dry, bittersweet rose petals. There's a phase that reminds me of cosmetics (rose cold cream) and a moment when rose is joined by what smells like immortelle (this reminds me of Etat Libre d'Orange The Afternoon of a Faun). As Rrose Sélavy develops further I detect a vegetal scent: a mild green-bitter aroma floating in the background (perhaps the non-floral parts of a rose bush). After wearing Rrose Sélavy for several days, it was added to my "to-buy" list (ever-blooming but never pruned, if you know what I mean); it joins Frédéric Malle Une Rose, Maria Candida Gentile's own Elephant & Roses and Serge Lutens Sa Majesté La Rose and Rose de Nuit as a favorite rose fragrance. The Duchamp-Ray-Rrose Sélavy collaboration has layer upon layer of possible meanings (many more than I mention above); Gentile, in her perfume, accents 'romantic' androgyny (male, as well as female perfumistas, I think, will feel comfortable wearing Rrose Sélavy) and complex Rrosy aspects (the perfume contains "rose petals," Turkish rose, May rose, rose accord, Michelle rose, rose stems and leaves). I'm betting Marcel Duchamp would be thrilled that Rrose Sélavy lives on in another guise. Maria Candida Gentile Rrose Sélavy Eau de Parfum is available in 15 ml (€36) or 100 ml (€170); for buying information, see the listing for Maria Candida Gentile under Perfume Houses. 1. Top quote and top left image: Marcel Duchamp as Rrose Selavy, by Man Ray, Philadelphia Museum of Art; Martha Chahroudi, Philadelphia Museum of Art: Handbook of the Collections, 1995, page 241. This is FUN indeed! It’s so refreshing when a house puts a little faith on our wits the way she does. A large part of me is saying, “step away from the rose,” as I’ve got loads of them, including most of your favorites . . . but a well-deployed Duchamp-Ray reference and it smells good? This is going to be hard to resist. My sample is on its way. BTW, I really love your reviews Kevin. Great review Kevin, and looking forward to trying this myself. Fabulous review. It looks like the juice has a great colour too, that slightly toxic green. Kanuka…I like the green too…but it may be the glass…my samples appeared clear. I loved your review and the inspiration for this one. It’s reminding me of ELDO’s Rossy -luscious, deep rose with some odd bitter twists. Like a rose reflected in one of those warped fun-house mirrors. And I think it fits its namesake. Do you find any similarities? I’ll have to seek this one out. Elisa…I don’t think I’ve ever worn the Rossy…just had a spritz drom a tester when it came out. Isabella…I can testify to the great variety of roses! I love your art focused reviews especially, Kevin! Really looking forward to trying this one. BTW, I’ve also wondered if Duchaufour’s Belle Helene for Parfums MDCI has anything to do with Belle Haleine. Thanks, Noz. I think the MDCI was inspired by the dessert, poires Belle Hélène…another fragrance I’ve not tried! The dessert has chocolate sauce, and the perfume doesn’t smell like chocolate at all, so I wonder! It’s somewhere between a variation of SL Daim Blond with pear, and a variation of Traversee du Bosphore with pear instead of apple. Very refined. I have a mini but I find I’m more likely to reach for either Daim Blond or Traversee du Bosphore. I agree with nozknoz – I especially enjoy your art based reviews, Kevin, and this one was certainly worthy of your treatment. I’m not a lover of rose perfumes in the main yet MCG composed one of my favourite perfumes – Sideris – and that has rosey facets. I also love VK’s Rozy Voile and the Rossy de Palma mentioned above is one I keep sniffing when I get the chance so who knows maybe I’m coming round. I think I need a sample of this and the Elephant one. Dona…me, too, it’s just been in the last five years I started to wear rose fragrances; I’ve always loved rose scent and taste, but never wore rose perfumes. Do try the Elephant and Roses for sure….